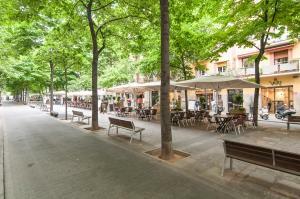 Set in Barcelona's Eixample District, Bbarcelona Apartments Gaudi Avenue Flats offers free WiFi and city views. This air-conditioned apartment is just 200 metres from Gaudi's famous Sagrada Familia. Featuring plenty of natural light and fitted with wooden floors, this apartment offers a spacious dining-living room with a flat-screen TV. The kitchen is equipped with a microwave, oven and a coffee machine. A washing machine and ironing facilities also available. There is a double bedroom and 2 triple bedrooms. The bathroom comes with a bath, shower and free toiletries. Bed linen and towels are provided. A variety of restaurants, shops and bars are within 1-minute walk from the accommodation. Sagrada Familia Metro Station, line 5, is 350 metres away. This apartment offers free WiFi and a spacious dining-living room with a flat-screen TV. The kitchen is equipped with a microwave, oven and a coffee machine. A washing machine and ironing facilities also available. There is a double bedroom and 2 triple bedrooms. The bathroom comes with a bath, shower and free toiletries. Bed linen and towels are provided.